The E3 Expo, better known just as “E3”, was held two weeks ago in Los Angeles, and to the delight of gamers around the world watching on YouTube and Twitch, held some major game and game hardware announcements. E3 was also full of emerging VR (virtual reality) technology. VR is a market that is still in its infancy yet continues to make big news because of its experiential potential, recency, and the big name players involved like Facebook Oculus, Google Cardboard, Samsung Gear VR, Sony’s Morpheus and Microsoft’s HoloLens. VR is not just about the big players, though, and in many ways, some of the most interesting VR tech wasn’t even shown at E3. One of these companies was IonVR, which I’d like to tell you about. It will take several years to answer the question if VR will fulfill its promise of a becoming mainstream. One thing that is certain is that mobile VR is going to be the mainstream access point for consumers. Mobile VR will drive VR in volume, VR content, and overall VR revenue for all but the most committed gamers, whose needs will be met by Facebook Oculus, Sony Morpheus, and HTC -Valve among others and whose price points are likely $499 and above. The mobile VR market is less defined. Google Cardboard is currently selling for $10 and is well, made of cardboard. While it is designed to work with most Smartphones, it is a DIY device, really targeted at developers. Samsung Galaxy Gear VR runs $200 and is designed to run on the Oculus SDK. Its major drawback? It only works with Samsung devices. The mobile VR market is still wide open, and one company in particular is working to solve some of these and VR’s challenges, a company called IonVR. IonVR is a startup with a small, passionate team looking to disrupt the mobile VR market. I recently sat down with IonVR’s Founder and President, Dan Thurber, to learn more about their VR technology. I also got a really cool demo of the product. IonVR was initially inspired by Thurber’s attempts to make walking VR with the Facebook Oculus DK1 in 2013. At the time he was working with cloud infrastructure and web security auditing. He also just liked to hack things up. The first prototype involved the Facebook Oculus DK1, a battery pack, and a wireless cabling system. While it worked, he explained that it also gave him motion sickness after pushing his body to the edge in the headset. This, along with advancements in mobile technology, led the team to focus in on solving VR sickness, which would allow for a better consumer experience and also long-form content development so that users could wear a headset longer and more comfortably. Thurber explained that initial mobile VR prototypes built in early 2014 involved Legos, lots of Legos, a Google Cardboard-style headset, and dozens of lenses. These revisions led the IonVR team to study optics more closely, including perception of motion. Current VR technology harnesses the processing power of the device. The IonVR team wondered if they could assist the devices by leveraging the power of the brain instead. This development process culminated in what will be the initial release of the IonVR headset. The IonVR team is led by Brooke Linville, the company’s CEO, who has a background in marketing and social media. Jorrit Jongma, the company’s lead software architect, who is also better known by many via his online handle as XDA-Developers’ own, Chainfire, is one of the most prolific smartphone hackers in the world with one of the most downloaded Android rooting apps in the world with tens of millions of downloads globally. The team also includes David Nazareth and Robert Heiblim, who bring decades of consumer electronics experience to the table. I’m always looking for “reasons to believe” with startups and in particular, I was impressed with Jongma’s and Thurber’s hacker backgrounds. 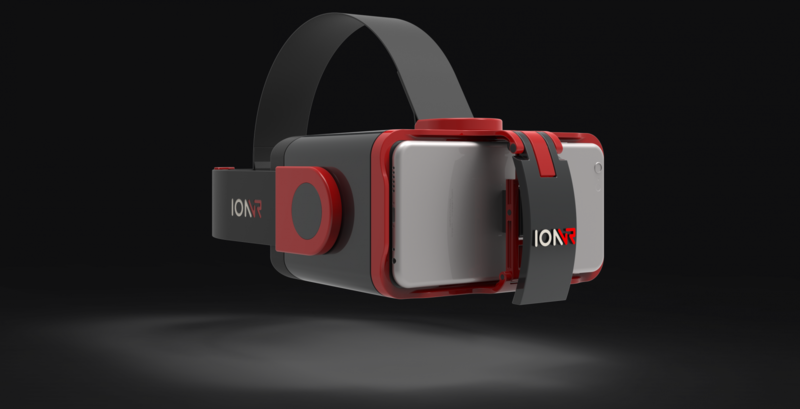 The IonVR headset, now preparing for its initial developer release, supports virtually any smartphone with or without a case from a phone as small as an Apple iPhone 6 to as big as a Google Nexus 6, with or without a case. I personally put my iPhone 6 Plus and LG G4 into the headset and it fit well. Dan also had a Samsung Galaxy S6 on hand, too and it fit well. Most people use smartphone cases, and being able to enable VR with a case still attached was a smart move as it removes a major step for the consumer. The IonVR headset is also modular, which Thurber says allows the user to remove or replace components and/or upgrade them with future expandable product offerings. This means that if you were to ever want to upgrade the lenses or customize the exterior you could just buy components instead of an entirely new headset. Further, the IonVR headset supports the use of glasses with up to 15mm of eye relief and provides for adjustable lenses. The headset provides a field of view of between 85 and 95 degrees. The IonVR headset is designed to work independent of any application and can run any Google Cardboard application or any smartphone VR application that isn’t locked to hardware. They believe in supporting as many SDKs as possible and are working to ensure this broad level of support. The unique, patented optical system to reduce motion blur is what the IonVR team claims is what separates them from others in the market and what allows them to match the Facebook Oculus DK2 in quality and eliminate VR sickness. Thurber reiterated that they believe that they have the best optics in VR and are ready to show it off. I had an opportunity to try out the IonVR headset for myself when I met with Thurber, and I was quite impressed with the different demonstrations he gave me. Those demonstrations ranged from 2D videos (that he somehow converted to 3D) to smartphone games that looked on par with their claims of being Facebook Oculus DK2 quality. There may be some variance depending on the phone, but Thurber’s own recommendation is always more PPI (pixels per inch) and more GPU processing power, which may be why so many of the mobile SoC companies are showing so much interest in mobile VR. Samsung has been working closely with Facebook Oculus in creating the Gear VR, which is now in its second revision with support for the Samsung Galaxy S6 and S6 Edge. The Gear VR could be the only official competition out there for the IonVR, but I’ll do more research on it. Unsurprisingly, IonVR is positioning themselves to be priced around the same as Samsung Gear VR, which makes things really interesting because Samsung’s Gear VR only works on some of Samsung’s devices while IonVR will work on any Android or iOS device that is greater than 4.7” or less than 6”. They also claim that they don’t use software distortion and color correction like Oculus does, which may reduce the overall overhead of the system and improve battery life in VR. Right now, most VR suffers from a huge lack of content, with lots of content locked in different silos. Both the Samsung Gear VR and Facebook Oculus VR are trapped inside of Oculus’ own ecosystem and the Vive within Valve’s. Google Cardboard is actually pretty open, and is considered the baseline standard for content, which is where most content producers are going right now. There are over 1 million Google Cardboard users in the world and that already represents the largest install base of any VR headset or platform. As such, the team at IonVR have already established their headset as platform agnostic, enabling them to work with virtually anyone that’s interested. That includes companies like The VR Company, a Hollywood-based VR content company with support from some of the top movie directors, with whom IonVR has already established a partnership to deliver the best, premium VR content and experience. They also have a partnership with XDA-Developers, which they just announced, that incorporates joint sponsorships of mobile coding events, hackathons, online content opportunities and exclusive product releases for the XDA community. XDA-Developers is the biggest online resource for everything mobile. They have over 6.5 million forum members and have been around since before Android was even a thing. Hollywood studios and game developers are extremely excited about VR and numerous studios, including 20th Century Fox, are making big bets on VR. Game engines like CryEngine from Crytek, Unreal Engine from Epic , and Unity Engine from Unity all support VR, which makes creating content for VR that much easier. IonVR’s hope is that a quality product will continue to enhance and accelerate mobile VR content creation. While there are a lot of fledgling VR technologies out there right now, there are very few established technological leaders. The market will continue to search out and support those with the strongest user bases, feature sets, and content availability. The team at IonVR have taken all of these factors into consideration with their IonVR headset, and it could easily become one of the biggest competitors to Samsung’s Gear VR, especially when you consider that it supports Apple’s iPhone and Google’s Android on the same device. That’s something only Google can say with Google Cardboard, and that experience is the lowest common denominator equivalent of VR, not something that most people will want to use for very long.